If you’ve been following me for a while you will know how hard it was for me to find reliable resources on raising a bilingual child. I spent hours on the web looking for ideas on how to teach my toddler Spanish. Oh! How I wish back then I had the Montessori Inspiration at Home Language series e-book! Teaching my toddler Spanish would have been so much easier! What I love about this e-book is that it is inspired on the Montessori method of an education that is based on self-directed activity, hands-on learning and collaborative play. This wonderful resource created by an amazing group of women: Vanessa from Mama’s Happy Hive, Isabel from Uno Zwei Tutu, Amruta from Mumma Diaries, and Yuliya from Welcome to Mommyhood will give you all the tools to help your budding linguist learn Spanish! Note: I received a copy of the e-book for purposes of review. This post may contain affiliate links and I may receive a small monetary compensation. Read my full disclosure here. My take on the e-book: Even if you’ve never heard of the Montessori method this book will provide you with an introduction and what is your role as a caregiver. It’s very easy to use! For instance, on the pre-reading activities it lists the materials you need and instructions on how to go about the activities. This guide is truly a no-hassle e-book. Teaching a second language starting on page 44 has a special place in my heart! You will read on the importance on teaching a second language, why it is important and how to teach your toddler. Plus, I love, love the Spanish printables! This e-book is truly a jewel, and a wonderful resource to have in your home. This Montessori inspired book is a helpful resource for developing language skills for toddlers. It includes over 200 pages, of easy to follow ideas, for caregivers to use with their children. Also, there are 150+ pages of printables and resources, including Spanish printables! There are a total of 12 chapters that include how to start, the role of the caregiver, story telling, labeling the environment, prereading activities, pre-writing skills, crossing the midline, sound games, mystery bag, songs & nursery rhymes, 3 period lesson, and teaching a second language. The printables include ABC cards with pictures and correct phonetic sounds, 3 part cards for matching work, sequencing cards, go-together cards, I spy games, opposites, nursery rhymes, labeling the environment cards, life-cycle matching cards (match Safari TOOBs), fruits & vegetables, category cards, checklists and resource guides! Now for the exciting part of this post! I have partnered with Montessori Inspiration at Home as an affiliate and do we have some awesome deals for you! 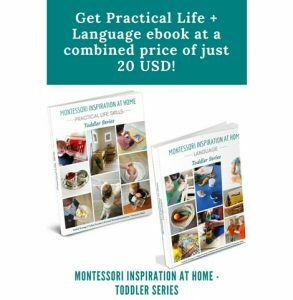 Montessori Inspiration At Home Life and Language e-book on sale for only $20! 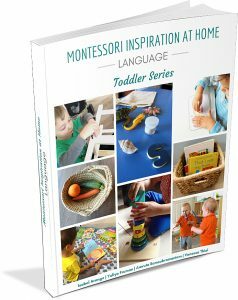 Montessori Inspiration At Home Practical Life Skills Series on sale for only $8.50! 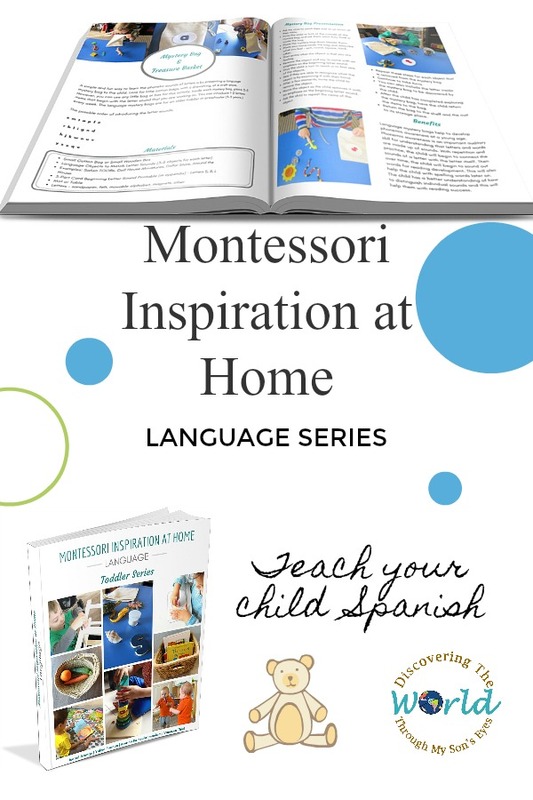 Montessori Inspiration At Home Language Series for only $11.50! I agree – I wish I had had this when my oldest was a toddler!